How is health literacy measured in America? Health communicators face the challenge of communicating what can be complex subjects to the general public. To do this, measures of a particular audience’s health literacy may be measured to create a strategic communication plan. 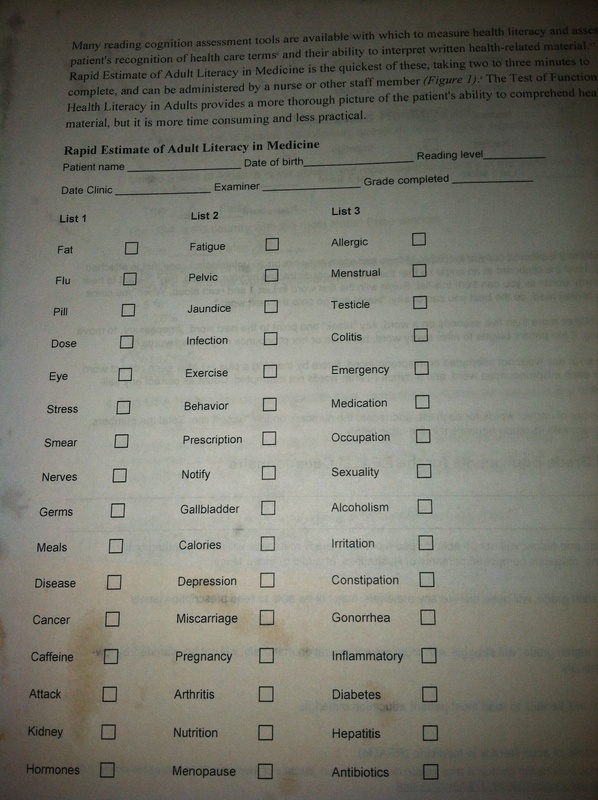 Surprisingly, the form below is how health literacy is tested in the United States. Is this enough? Is there a more comprehensive strategy? This test simply measures whether or not the patient can read the words aloud, not if they can comprehend them. Research also shows that a majority of the population is health illiterate based on this test. What are effective mediums that health communicators can use to educate lay people? This, is of course a rhetorical question that will appreciate any comment. I hope I will slowly learn some sort of answer to this question as I research more. The Rapid Estimate of Adult Literacy in Medicine takes two to three minutes to complete and can be administered by a nurse or other staff member.